It's a shame we had to complain about our new drone, but it doesn't work, no matter what they said. We bought one for £149.95 in the end. I decided that as she knew what she was getting, that we would try it out before Christmas which we did and it didn't work correctly. I tried again and again and still it didn't, so I sent it back recorded delivery asking politely for a refund. "Two weeks later it was sent back to me with a brief note saying it did work; however, it didn't." Rather than send it back, I emailed their customer complaints and explained, again politely, that it didn't work, but I would keep it at my office and when I received a refund I would send it back. I received another email saying it did and if I sent it back they would check it again. My third email was slightly stronger saying that I wasn't impressed with their customer service, but could they review the situation and refund me. I got an email back basically saying no and that is when my fourth and final email was sent, which basically said that the gloves were now off and if they didn't immediately refund me, not only would I contact my credit card company (for I always buy goods like that on a credit card as they guarantee to help you out if there are any problems), but I would demand to speak to someone at the top and hit the social media with full details of the problem, naming them as complete shysters. The reply was so quick it was unbelievable. They would immediately refund me and would I please send the goods back to a Freepost address. So sorted. This is typical I suspect. I guess their customer service team are told to fob customers off. I've only once before resorted to the 4 point plan which again worked. So I've kept my side of the bargain in so far as I've not named the shop, but my advice is don't be fobbed off by them. I sell magic and illusion goods goods online and into the trade (theatres and shows etc), and I put an unconditional guarantee on everything I sell having fully tested anything that comes through our office. If someone buys something from my company and they are not happy with it, I refund them and then chat about it if required. Sometimes they haven't quite understood how a magic gag works, or occasionally it is faulty when they get it and 99% of the time they rebuy it, or something else because they have been treated so well. To be fair I don't get many complaints, but when I do, I often turn them into very good customers because they know that they won't be fobbed off. It's not rocket science to treat customers well and the reason I use the same people again and again, whether it be an electrician, plumber, or garage, is mainly due to how they look after me if there is a problem. The 4 point plan works very well. Be nice at the start as that should usually work, but by the 3rd excuse, you need to go in hard and quick. But also be aware that you may need to follow any threat through, which I'm always happy to do. 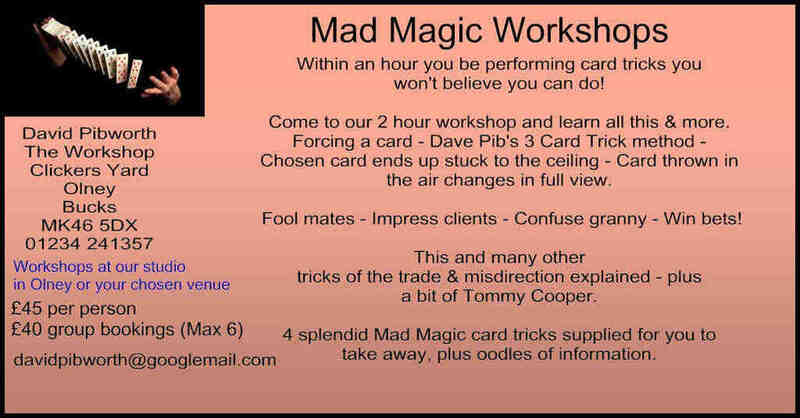 I'm running a magic workshop at my office in Olney on the 18th Feb this year at 10.00am lasting 2 hours. It costs £15 per person and is an intro to easy magic. You'll get 2 tricks to take away with you. It's part of a series of workshops in Olney which are starting at around the same time including music and drama. Have a look at the magic goods I sell in the knowledge that you will always get great service: Click here to visit my eBay store.